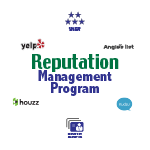 The BeDistinguished option of the Reputation Management Program includes everything found in the BeReputable and BeRespected options, plus an easy to use email review invitation system to greatly improve the review gathering process. BeDistinguished is our top level option of the Reputation Management Program. To view our entry level and mid level offerings, please review the BeReputable and BeRespected options.